Jason is entering his 6th season with the Syracuse Mets. He was born & raised in North Syracuse and is a graduate of Bishop Grimes Jr./Sr. High School. After high school, Jason attended the State University of NY at Fredonia and the United States Sports Academy (MS). Jason began working in baseball with the Watertown Indians in 1993; over the years he made stops in Batavia, Staten Island and Auburn. He worked for 10 years out of baseball with Hilti, Inc. before returning to the game in 2013 with the Syracuse Chiefs (now Mets). When he is not at historic NBT Bank Stadium, Jason enjoys spending time with his family, fishing and cooking. It may surprise you to know that Jason was also a member of the 1992 Men's DII Rugby National Championship team, Battleship Rugby, from Mobile, AL. Jason appreciates most everything about Syracuse, but he especially loves the people, the change of seasons and the ability to get almost anywhere in 10-15 minutes. Katie has been with the Syracuse Mets for 6 seasons. Katie was born and raised in Vestal, New York and attended Syracuse University. Katie began working in baseball in high school for the Binghamton Mets (now Rumble Ponies). She completed internships in Binghamton and Syracuse before being hired full time for the Syracuse Chiefs (now Mets) in 2014. Katie also worked with Koenig Advertising Public Relations and SU Athletics in college. Katie enjoys exercise, cooking and spending time with her dog, Molly. In the off-season, she spends time traveling, shopping and attending SU football and basketball games. Her favorite thing about Syracuse is the fall. Anthony has worked at NBT Bank Stadium for 14 years. He is originally from Syracuse, NY and attended the University of Scranton for college. Anthony has served in many different roles around the stadium, and has earned his role as a true multimedia professional. Anthony is the man behind the scenes, making everything run - from the video board, to the music, and beyond! Anthony is not only a multimedia professional, but he is a champion "The Office" trivia player. He loves the 3 W's: woodworking, whiskey tasting and working out. Anthony's favorite thing about Syracuse is that even though we are a small city, we have a lot of pride! Bailey has been with the Syracuse Mets for 6 seasons. Born and raised in Syracuse, New York he attended college at Suny Oswego and Onondaga Community College. Bailey also worked for Wegmans and Spectrum Sports while in school. Bailey enjoys drumming, hanging out at Historic NBT Bank Stadium, and playing video games with friends. His favorite thing about Syracuse is Dino Babers. Will has been with the Mets for 8 seasons and is originally from Cicero, NY. He graduated from St. John Fisher College in Rochester, NY. Will was a member of the Syracuse Chiefs (now Mets) grounds crew for 4 seasons throughout high school and college. He also completed internships with the Rochester Red Wings and Rochester Americans during his time at St. John Fisher. Will loves Syracuse sports, spending time with his family and binging on TV shows. Will's proudest moment is when he and the 2015 grounds crew won the MiLB Triple-A Field of the Year Award. His favorite thing about Syracuse is Tully's. Arnold has spent 6 seasons with the Syracuse Mets. He was born in Philadelphia, PA and attended Delaware State University. Arnold worked for the Philadelphia Sixers, the Camden Riverhsarks and Centerstate CEO before being hired by the Syracuse Chiefs (now Mets). Arnold began as an Account Executive and has worked his way up to his current role. Arnold and his beautiful wife, Lauren, have 2 little girls, Olivia and Naomi. In his free time, Arnold enjoys traveling with his family, binge watching "The Office", volunteering in the Syracuse community and fishing at Alexandria Bay or Owasco Lake. He is also a proud member of Kappa Alpha psi Fraternity Inc. and a cigar aficionado. Arnold's favorite things about Syracuse are Gannon's Ice Cream, the Finger Lakes and all the breweries. Jeremy has been with the Syracuse Mets for 4 seasons. He is a native of Sullivan, OH and went to college at Bowling Green State University. Jeremy started his career in baseball in the clubhouse. He spent his first season as a Clubhouse Assistant/Intern with the Detroit Tigers from 2007-2008. From there, he went on to work with the Louisville Bats, the Columbus Clippers, the Potomac Nationals and the Syracuse Chiefs (now Mets). Jeremy joined the Syracuse Front Office in 2016. Jeremy enjoys anything sports related, working out, video games, and playing with his chocolate lab, Lucy. Jeremy's favorite thing about Syracuse is the Syracuse Mets and his co-workers, Bill Ryan and John Stewart. John has worked on the field at NBT Bank Stadium for 12 seasons, and has been the head groundskeeper for 10 seasons. John is a native of Syracuse, graduating from Nottingham High School and then attended SUNY ESF. He began working with turf as a child with his grandfather on golf courses. In 2015, John led the Chiefs (now Mets) and his crew to an award-winning season, when the field was named MiLB Triple-A Field of the Year. John is an avid SU football and basketball fan. He also enjoys golf, home improvement projects and sunshine. As a native, John's favorite thing about Syracuse is Westcott Street. Kyle is entering is 6th season with the Syracuse Mets. Kyle is originally from Cortland, NY and attended Syracuse University. He has worked with many different Syracuse sports teams, including the Syracuse Silver Knights, Syracuse University Athletics and the Syracuse Mets. Kyle loves golfing, watching sports, sleeping, and spending quality time with family and friends. Kyle is also an avid bobblehead collector and has an impressive collection of bobbleheads from various sports teams, movies, TV show, celebrities, politicians, and more! Kyle's favorite thing about Syracuse is The Dome! Danny has been with the Syracuse Mets for 5 seasons. Danny was born and raised in Syracuse, New York and attended Onondaga Community College. Before baseball Danny had worked in television, being a Production Assistant for WCNY and an editor for NewsChannel 9. He completed an internship with the Syracuse Chiefs (now Mets) before being hired full time in 2017. Danny is a multi-hobbyist and in his spare time enjoys playing video games, making videos for his YouTube channel GameShell, and raising money for Upstate Golisano Children's Hospital. His favorite thing about Syracuse is its rich history. Phoebe is entering her second season with the Syracuse Mets. She is Syracuse native and she attended Fredonia State University. Phoebe began her career in sports with the Syracuse Chiefs (now Mets), as a merchandise clerk in the souvenir store at NBT Bank Stadium. From there, she earned a spot as a front office assistant and was then promoted to her current position. Outside of baseball, Phoebe's favorite pastime is cheering on the New York Giants with her dad. When the weather is nice (and the Mets are away), she also loves impulse road trips with friends. On days when it is too cold to leave the house, Phoebe can be found diligently working on her many coloring books and watching crime shows with her mom. Phoebe's bucket list includes attending a game in every MLB stadium and a game in every NFL stadium. Phoebe doesn't just love one thing about Syracuse - she loves it all! Katie is entering her first year full year as a member of the Mets Front Office, after completing an internship here in 2018. Katie is from Marathon, NY, but headed south for college, graduating from the University of Tampa, go Spartans! While in Florida, Katie worked for the Tampa Bay Buccaneers, the Toronto Blue Jays Spring Training/Dunedin Blue Jays, USF Athletics, and the Tampa Bay Rays. Katie's favorite activities include riding rollercoasters, watching football and hockey, traveling, puzzles and binge watching CSI. It is Katie's goal to see an MLB game in all 30 stadiums across the USA! Katie believes that if she had been alive during the 1970's she would have followed the Eagles on tour. She is also a lover of classic rock, "Star Wars", "Back to the Future", and long walks on the beach. 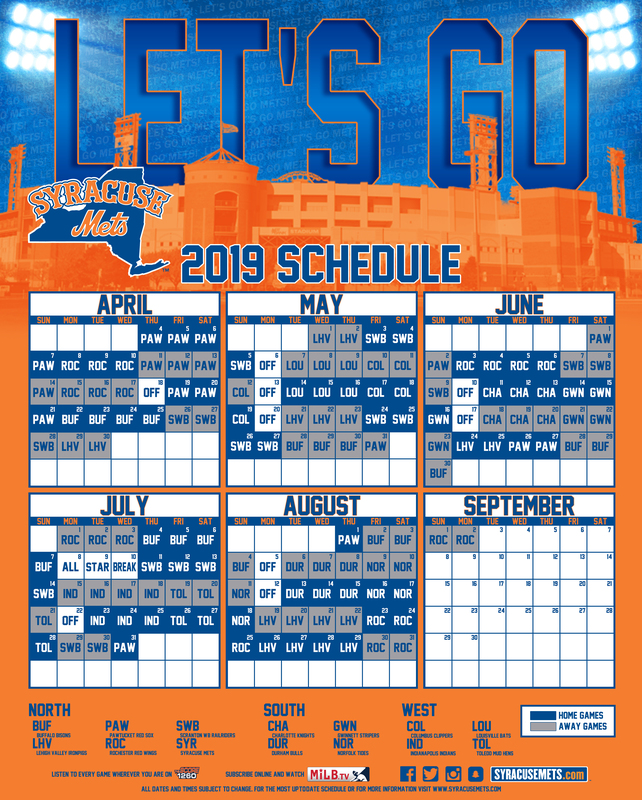 This is Billy's second season with the Syracuse Mets, joining the team officially in 2019 after an internship in 2018. Billy is originally from Syracuse and graduated from Syracuse University. Growing up, Billy worked on his families' dairy farm, Scholten's Dairy Farm, where he has spent most of his life. Before coming to the Mets, Billy completed an internship with the Syracuse Silver Knights soccer team. Billy's favorite activities are hiking, snowmobiling, going to the movies, spending time with friends, and mowing the lawn. His favorite thing about Syracuse is the Great NYS Fair.